Trek Bicycle derailleur hanger available for sale online all hanger gearbox models for your Trek bicycle. Browse the catalog to find your hanger. If you do not find your model , please contact us to WhatsApp to (+39)347.9013632 , we'll help you find the dropout compatible with your model of bicycle. Our dropouts are better quality than the original, produced from Pilo, leader in the production in own of dropouts return for all companies in the World. 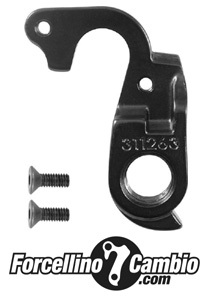 Trek aka #311263 derailleur hanger 6061 T651, made with CNC technology. Black anodized. Lighter and more durable than the hanger series. Trek 4300 2010 - 2012 derailleur hanger 6061 T651, made with CNC technology. Black anodized. Lighter and more durable than the hanger series. Trek 4500 Disc 2012 derailleur hanger 6061 T651, made with CNC technology. Black anodized. Lighter and more durable than the hanger series. Trek 4900 derailleur hanger 6061 T651, made with CNC technology. Black anodized. Lighter and more durable than the hanger series. Trek 6000 WSD 2012 derailleur hanger 6061 T651, made with CNC technology. Black anodized. Lighter and more durable than the hanger series. Trek 6500 2010 derailleur hanger 6061 T651, made with CNC technology. Black anodized. Lighter and more durable than the hanger series. Trek 6700 2010 derailleur hanger 6061 T651, made with CNC technology. Black anodized. Lighter and more durable than the hanger series.